There are many ways to encourage people. 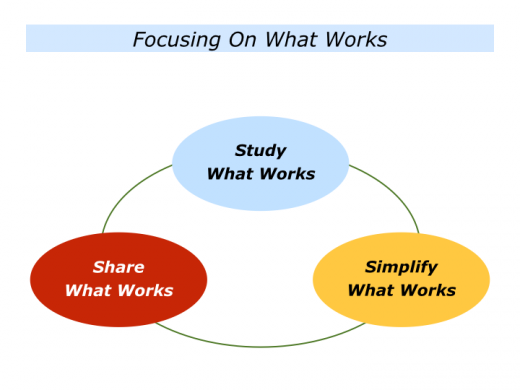 One approach is to study what works, simplify what works – in a profound way – and share what works. It is then to provide people with practical tools they can use to follow these principles in their own way. Bernard Haldane and Don Clifton used this approach in the 1940s. They studied and shared knowledge about when people performed brilliantly. This helped to give birth to the modern strengths movement. You can discover more about the contributions made by Bernard and Don via the following links. Sports psychologists applied a similar approach from the 1970s onwards. They asked athletes to recall their best performances and what they did right. They then helped athletes to focus on how they could follow these principles – plus maybe add other skills – in the future. David Cooperrider and Diana Whitney followed this path when creating Appreciative Inquiry. They invited people in organisations to clarify the principles they had followed to perform brilliantly in the past. 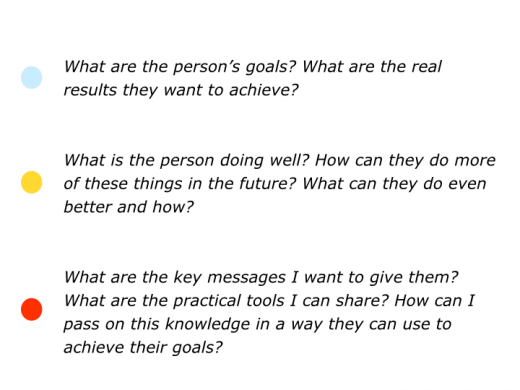 People then focused on how they could pursue these principles to do great work in the future. You can learn more about Appreciative Inquiry via the following link. Describe a specific area – a topic, theme or particular field – that you would like to learn more about. You may want to explore a specific topic about people, sport, education, leadership, business, organisations or whatever. Describe the specific things you can do to study what works in this area. You may want to learn from books, experts in the field, examples of best practice or whatever. Great workers often demonstrate simplicity in action. A great dancer, footballer or artist can make executing the most difficult skill look deceptively easy. They make complicated things look simple. This is the result of combining their natural talent with years of practice. Great educators who know their subject often demonstrate the second simplicity. Getting to the heart of the matter, they say things that are simple yet profound. People sometimes go through the following stages in life: simplicity, complexity and again simplicity. They start by seeing life – or the activity in which they are talented – as simple. Speaking with bravado, they state clearly what they believe to be true. Passionate about these beliefs, they demonstrate the idealism and confidence of youth. They may then enter the age of complexity. Gathering information, they become ‘experts’ and speak in a more complex language. Sometimes they over-analyse. This does not help them or other people. Whilst still performing well, they feel something is missing. Overcoming challenges, they enter another dimension. They may return to their original philosophy, but experience has brought wisdom. The pains and pleasures of life bring an extra timbre to their voice. 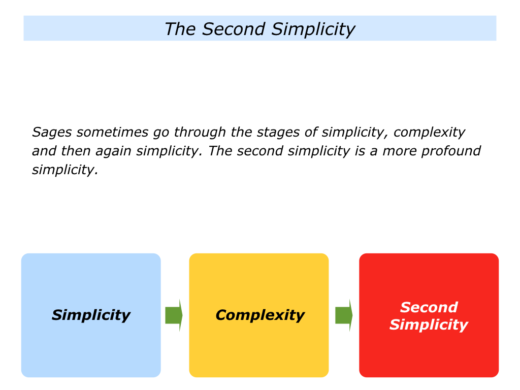 The second simplicity is a profound simplicity. Speaking from the depths of their being, their words resonate more deeply. They are real, rather than in role. They have wisdom in their bones. Passing on what they have learned in life, they want to help others to succeed. 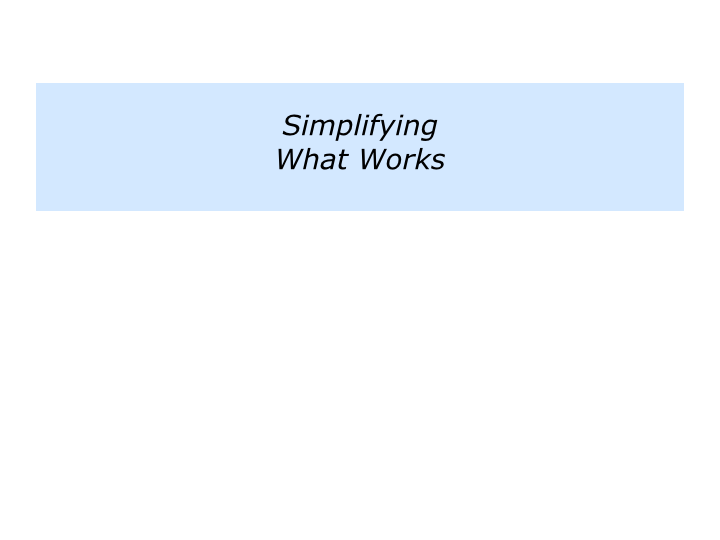 There are many approaches to making complicated things simple. Here is one. Great educators often start by focusing on a specific activity they find fascinating. They may also have a feeling for the activity and the ability to see patterns. Pattern recognition is one of the keys to identifying and, if appropriate, delivering peak performance. Such educators often take the following steps when studying and simplifying knowledge in a particular field. Bearing in mind the area you want to study, try tackling the exercise on this theme. 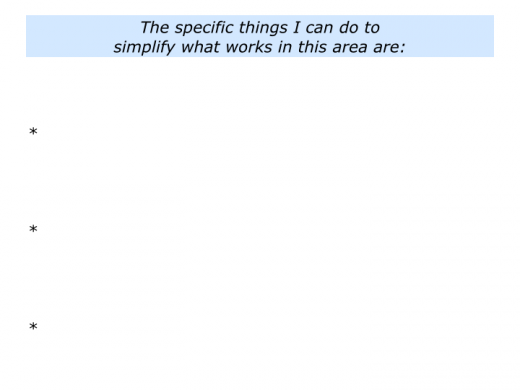 Describe the specific things you can do to simplify what you believe works in this area. Many people have experience, knowledge and wisdom. But then comes another question. How to pass on the knowledge in the way that helps other people to succeed? There are many ways to share knowledge. You may choose to encourage people, teach, write, make films, lead teams or whatever. Whichever route you choose, it can be useful to learn from the steps taken by good coaches. Such coaches start by watching a person in action or studying examples of their work. 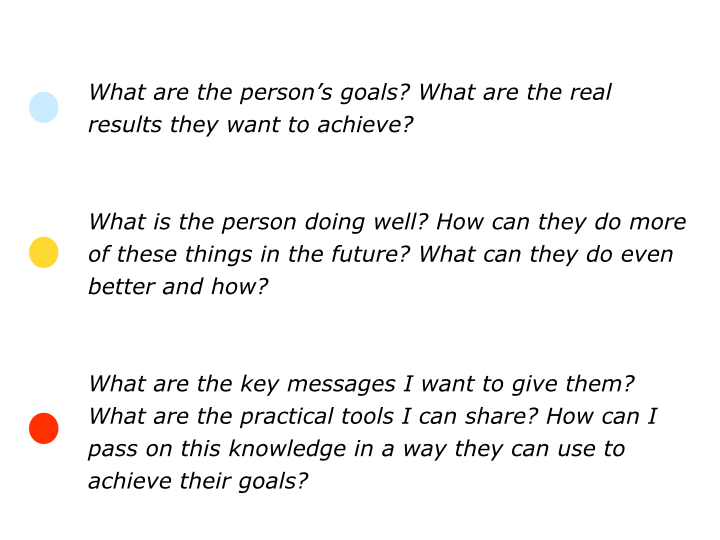 They then ask themselves certain questions before passing on knowledge in a way the person can accept and use. They often go through the following process. Bearing in mind the area you want to study, try tackling the final exercise on this theme. Describe the specific things you can do to share what works in this area.